If you have missing teeth and are struggling with traditional fixed bridges or full and partial dentures, you understand the drawbacks of these conventional methods for tooth replacement. Luckily for bridge and denture-wearers, dental implants provide a fixed and durable alternative for replacing teeth. If you’re looking for a dental office that provides dental implants in Campbell, CA, Hughes Dental Group can help. A dental implant is used to replace a whole tooth – root and crown – after it has been extracted due to severe damage, or knocked out in an injury. In the event of total tooth loss – no teeth remaining in either the upper or lower jaw, or both – dental implants can be strategically placed to act as stabilizing anchors for permanently securing full dentures. If you have a tooth that is in need of an extraction, the team at Hughes Dental Group can even place your dental implant the same day as an extraction is performed. • A faux tooth root – A titanium post, that resembles a miniature screw, is placed in bone in your jaw, at the site of the missing tooth. Because titanium is compatible with bone, the two materials integrate so that your new tooth is just as stable as an organic tooth. • A connecting piece – On top of the implant post will be an abutment, which allows for secure placement of your dental crown. • A new tooth – Our on-site dental lab will create a porcelain dental crown that closely matches your existing teeth. Your new replacement tooth will seamlessly blend with your natural smile, for an ideal tooth restoration. We have a periodontist on staff who is able to place your implant right at our Campbell, CA dental office – you won’t to spend time with an outside specialist to receive comprehensive care; Hughes Dental Group can complete every stage of your implant treatment. How Can I Tell If I’m Healthy Enough for Dental Implants? We’ll start your treatment by scheduling an initial exam where we’ll evaluate your oral health. Ideal candidates for dental implants do not exhibit signs of periodontal disease and have a healthy amount of bone density in their jaw to support implant placement. Signs of irritated gum tissue or diminished bone volume will need to be addressed before your implant can be placed. Dental implant patients can rest easy, as Hughes Dental Group is home to a number of specialists and general dentists who are able to care for every facet of your oral health. Because your dental implant is firmly rooted into your jaw, just like your normal teeth are, it is incredibly stable and can last a lifetime, with routine care. Dental implants should be flossed and brushed, just like natural teeth. Some patients may experience some standard wear of the implant crown after a time, but the crown can easily be restored to new condition. Unlike dentures and bridges, a dental implant is a freestanding tooth. Getting a dental implant does not require altering healthy teeth and does not negatively impact healthy mouth structures, or require special, daily routine care or concern. Are you missing teeth and tired of dealing with dentures and other conventional teeth replacement options? 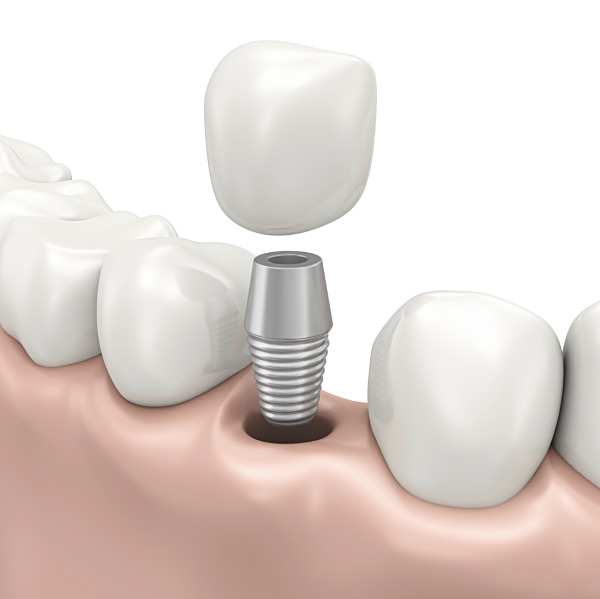 Contact Hughes Dental Group in Campbell, CA to schedule your dental implant consultation.